publications | Barbara Schildkrout, M.D. Dr. Schildkrout has received praise for her ability to make complex, clinically useful medical information available to a broad audience, including psychologists, psychiatrists, social workers, counselors, nurses, patients, and families. 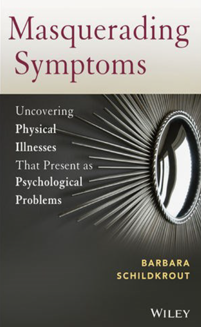 Masquerading Symptoms: Uncovering Physical Illnesses That Present as Psychological Problems (just published) is a sophisticated, engaging resource compendium of practical information and covers 71 different medical diseases that can masquerade as mental disorders. Because the presentation of these physical diseases is marked by changes in mental state and/or behavior, patients with these conditions often seek help first from a therapist or in a psychiatric emergency room. This book is a welcome contribution for use in psychiatry residency training programs to fulfill the milestones requirements in clinical neuroscience and psychiatric evaluation. Mental status section that includes a full discussion of the possible signs and symptoms a patient might have and then directs readers to the diseases that might be causing these. 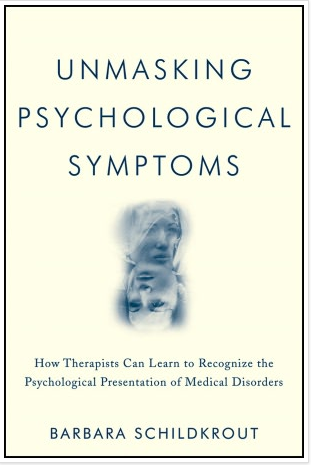 “Unmasking Psychological Symptoms: How Therapists Can Learn to Recognize the Psychological Presentation of Medical Disorders is designed to help therapists bridge the gaps in their expertise between psychology and medicine so as to prepare them to better understand their patients and have a higher index of suspicion about medical factors that may affect them.